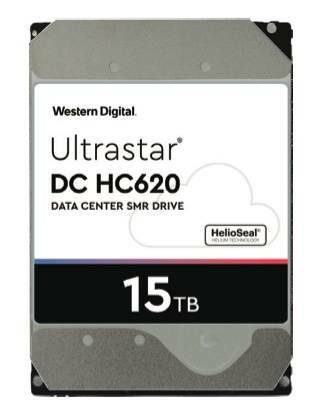 Western Digital has claimed its shingled 15TB Ultrastar DC HC620 is the highest capacity disk drive in the world. It is a follow-on from the 14TB Hs14 drive, available in either 14 or 15TB capacities. Both the Hs14 and the HC620 are helium-filled drives with, we understand, eight platters. Shingled magnetic recording enables tracks on a platter to overlap, like roof shingles on a house, increasing platter density. But re-writes are slow because data must be written sequentially so the writer doesn't destroy data on the overlapping tracks. These Ultrastar drives are host-managed, meaning the data-writing software on the host has to be modified to use them, making them unsuitable as drop-in replacements for non-shingled disk drives. Western Digital said they are optimised for sequential writes and hyperscale data centre operators need them to cope with huge volumes of data from sources like video surveillance initiatives, storage for regulatory compliance and Big Data. The 15TB drive adds just 7 per cent to the 14TB drive's capacity by upping the areal density from 1,034Gbit/sq in to 1,108Gbit/sq in. A 4U, 60-drive enclosure can store 900TB of data with these drives, compared to 840TB with the prior 14TB drives. A rack of 10 enclosures can store 600TB more than before. The sustained data transfer rate is 255MB/sec; 233MB/sec with the Hs14. Both have a 515MB buffer, spin at 7,200rpm, and come with 6Gbit/s SATA or 12Gbit/s SAS interfaces. Competitors Seagate and Toshiba have 14TB drives so we shouldn't have that long to wait before they bring out 15TB drives as well. Eyal Bek, VP of product marketing at Western Digital, said: "By capitalizing on our highest-capacity SMR storage solutions, our customers' investment can not only be fully leveraged today, but for subsequent generations of SMR areal density improvements for continued infrastructure optimization." This implies that forthcoming higher-capacity MAMR recording technology drives will employ the same host-managed shingling scheme. They should deliver better than the niggardly 7 per cent capacity upgrade.